After what has been a tumultuous week for me, I would like to clarify the meaning and intent of the letter to the editor that I wrote in my personal capacity last week. (2019-01-27 Feedback here). My intent in writing it was to share a personal life experience regarding a drug, Gabapentin, which has been literally a life saver for me. Neither my intent, nor do I believe what I stated, was to advocate the use of Gabapentin on horses that were racing or in jurisdictions that may bar its use. As I specifically wrote, I am neither a doctor nor a scientist. I know absolutely nothing about what the drug’s efficacy might be on equines, nor do I purport to. I believe that anybody who knows me and, I would hope, those who know of me, know that if anything, I am and always have been a strong proponent of drug use restraint unless it is an absolute necessity for the health and preservation of the horse. I came out under John Simpson Sr, who’s philosophy, paraphrased in simplistic terms, was: “If a horse, especially a young horse needs to be vetted, then it needs to be turned out.” To a very large degree, I still believe in that philosophy. To be clear, I was not advocating the use of Gabapentin with respect to horses that are racing or in jurisdictions barring their use. I do and always have advocated to the contrary. As of Sunday January 27, 2019, after approximately 51 years and 10 months of loyal service to Hanover Shoe Farms, I am no longer in their employ. What we love about the HRU Forum is allowing harness racing fans with different opinions to offer them in constructive ways. 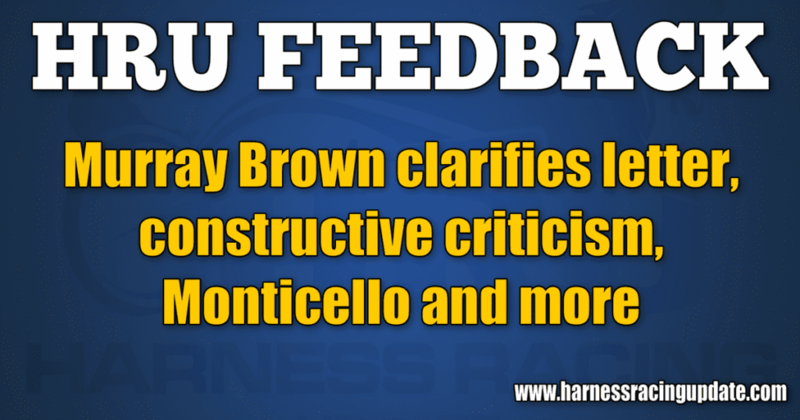 While reader Ken Young provided his case for shutting betting windows before post time (2019-01-27 Feedback here), I disagree. First, whatever time the windows close, they would be closed for everybody. If you see a large bet come in before the race, what good does it do you? It would give you more time to stew that you could not “follow the hot money.” Of course, we still have the perception issue with the current technology restrictions of odds changing after the race starts. This is a problem for many people. Professional psychics and other purveyors of the supernatural learned to take advantage of us mere mortals when they realized that we only remember the unusual occurrences and not the usual. As one of the few fortunate humans who is immune to this natural disease of the mind (thereby admitting I am a freak of nature), I am also aware how many times I collect more than I expected because the odds changed in my favor. Seems to be a pretty even split. As for betting on hot money, I try to do just the opposite. Unfortunately, in this day and age, because of the small pools you may be betting against the hot money with two minutes to post, and end up joining the crowd when the race starts. It goes both ways. If you believe “whales are wagering large sums of money, which are still below their financial levels” what makes you think they are ahead of the game? I welcome sophisticated data sets and programming specialists into the fray. As an old-time computer programmer, I experienced greater success when I learned many years ago that the soft skills of handicapping are more reliable than strict technical analysis. I wonder if those sophisticated data sets include drivers known for their “tells” on the track when those drivers like their horses a lot. Plus, knowing that a driver likes his horse does not always indicate victory, But it MORE OFTEN THAN NOT indicates his driving strategy during the race. Hey, Richie Silverman, since you no longer drive, I can tell you that you were an easy read. As for you drivers still out there, a magician never reveals how he does his tricks. Returning to the $46 payoff, though, the real issue is that certain wagering portals allow you to wager closer to “the bell” than others. Now that is an uneven playing field that needs to be addressed. Mr. Gural is correct (full story here). The NJ racetracks will have to justify the subsidies by showing a resultant increase in handles for 2019. Perhaps, all three (New Jersey) tracks should consider making more past performances available to the public for free. Yes, this comes with a slight increase in cost to the information providers. However, it appears that when tracks provide past performances free online on races, handle goes way up. One notices the whole card is offered online for free on both Haskell Day and Hambletonian Day. I think this idea is kind of a no brainer. I’m sure if printed, there will be a few claiming I have lost my mind. Rest assured, I still have all my marbles. This comes as no surprise (2019-01-27 Feedback here). Two things. Once again, when the decision to issue a casino license was under consideration, geographic considerations were either ignored, neglected or the plan was to set up Monticello Raceway for failure. Since its doors opened, the nearby Resorts World casino and Hotel has been losing money. Revenue projections have been over estimated by quite a margin. Resorts World management had predicted annual first year revenue of $280 million. The actual is half that. A couple things. Due to its location, Resorts isn’t exactly “down the street” from the NY metro area. Despite its limited access design, NY 17 / I 86 is a roadway in desperate need of repair. Plus, casino management insists upon high table minimums, which generally keep the average player away. Also, Resorts places an inflated value on its lodging. Room rates are inflated as compared to the rest of the region. Now, despite this, Resorts has made an obvious adverse effect on Monticello. As these two facilities are a short distance apart, the casino would have to cannibalize not add to revenue streams. Essentially, the new casino did not create as much new business, versus simply moving business from the slots at Monticello to the new casino. As far as racing at Monticello is concerned, who knows? With the average purse around $3,500 per carded race, it has to be difficult for horsemen and owners to scratch out a living. My guess is like other tracks across North America that have seen their revenues siphoned off by other forms of gaming, Monticello may very well become the next “victim” of progress.